Throughout her life, she had a rocky relationship with her mother – and now her mother is all she has left. Through a nostalgic look back, Samantha recognizes the presence of God in an ordinary life. She learns more about herself as a wife and mother who has had her share of sorrow and blessings. 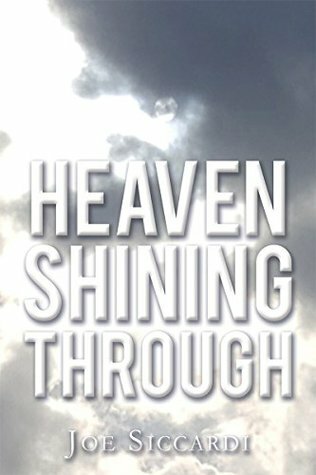 As her faith increases, she is able to see her mother through new eyes, leading to reconciliation …and is reminded of that every time she sees Heaven Shining Through. A well written novella about a woman named Samantha who thinks back on her life as she takes care of her ailing mother. It was a very short and easy read. It felt almost non-fiction rather than fiction, as Samantha recounts her life, the people she met, and the choices she made. Her relationship with Chad was meaningful and it was nice that they loved each other so well, even when life was rough. There were several swear words, talk of marital relations, and life choices, and while faith was mentioned, it wasn’t really the sole focus. I was expecting a bit more of a redemption thread. Still, it was written well, and flowed nicely. I wouldn’t recommend for younger readers, though.